I’ve often remarked in this blog that we don’t often see similar cars on the road. Sometimes it’s weeks before we see another one and with the Honda S2000 and now the Toyota GT86 we’ve been on holidays in Europe and not seen another one at all. Not even on the way from the Midlands to Calais. So I thought I’d see how they compare. The Toyota GT86 and Subaru BRZ are essentially the same car, so I’ll count them as one. According to How Many Left there are approx 4,000 GT86/BRZs on the road plus about 600 BRZs, so 4,600. Pandas? Well if we count only the Series 2 Panda made from 2003–2012 there are… a lot. I can’t easily separate out the second generation cars from the earlier and later Pandas. However, suffice to say you see them everywhere. But how about the Panda 100HP? These are definitely easier to count and harder to see. 1,700 on the roads in the UK. That’s rare. Much rarer than a GT86. 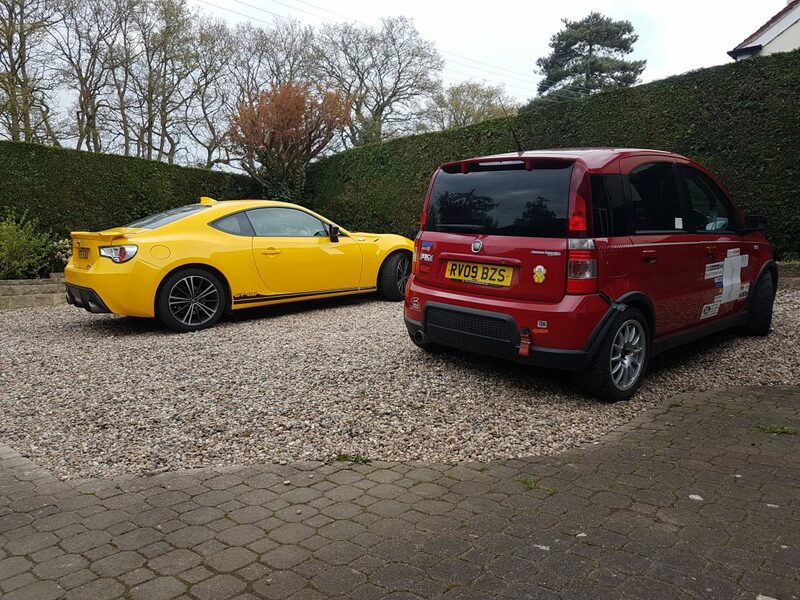 But if we want really rare, the yellow GT86 Giallo takes the biscuit. Only 82 left of the 86 sold in the UK. My Dad always liked to be a bit different too. When others had Fords and Vauxhalls we had a Vanden Plas then a 3 litre Rover and later a series of Lancias. For a second car where the neighbours had Minis and Vivas we had a Renault Dauphine, then an NSU Prinz. On May 26/27 at Prescott Hillclimb the Bugatti Owners Club is holding their annual French weekend – La Vie En Bleu. On the Saturday they are incorporating La Vita Rossa to feature Italian cars. Undoubtedly it will be oversubscribed as all those Bugattis, Ferraris, Maseratis, Lamborghinis and Alfa Romeos vie to get on track. However, I’ve entered the humble Panda and am hoping the organisers recognise the pedigree and rarity of the 100HP and give me a shot up the hill. For more information about La Vie En Bleu see Prescott Hillclimb. Previous Previous post: What’s red and Italian?